Peter's Feeders PB-31 Peanut Butter Feeder: Give your birds a healthy and delicious treat without the mess. Peter's Feeders has been making quality feeders since 1982 and they are still the best! Peter's Feeders PB-31 Peanut Butter Feeder is a great way to provide a unique feeding experience for you and your birds. Peanut butter is a healthy and delicious treat for insect eating birds because it contains protein and fats similar to their natural diet. The energy birds get from the peanut butter is especially important during the cold winter months. Our PB-31 Peanut Butter Feeder has two feeding stations with ample horizontal cups to hold the peanut butter. Most peanut butter feeders on the market function by slathering peanut butter on the outside of the feeder body or on a mesh grill. 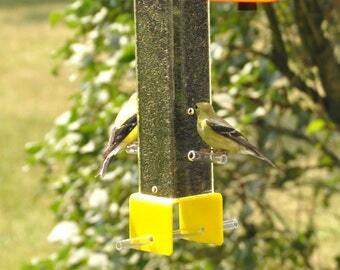 These types of feeders are messy and cannot be used during the summer because the peanut butter will melt off the feeder in the heat. With our Peter's Feeders PB-31 the cups neatly contain the peanut butter so it works perfectly for year-round feeding. 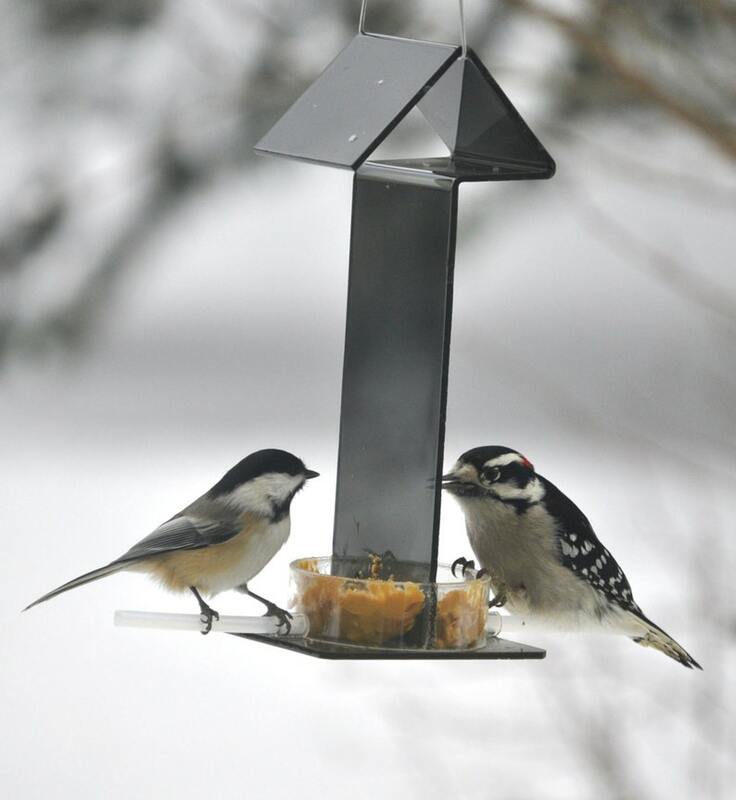 The PB-31 is a favorite feeder for Black-capped Chickadees and Downy Woodpeckers but you will also see other insect eating birds swing in for a snack! The PB-31 has a perch for each of the feeding cups so that peanut butter loving birds of all sizes can sit and eat comfortably at your feeder. As with all our Peter's Feeders they are not only functional but beautiful, too. With a sleek, modern look this feeder is the perfect addition to your bird feeding collection. To see video of this feeder in use copy and paste the link below into your URL bar or search youtube for "PetersFeedersOnEtsy". Hummingbird Feeder HB-1 by Peter's Feeders: The unique design let's you actually see the birds drinking. Window Feeder by Peters Feeders: Brings the birds up close for great bird watching fun. Oriole Feeder OR-1 by Peter's Feeders: This oriole feeder attracts birds like a magnet. Looks very elegant! Thank you! I love the bird feeders made by Petersfeeders. They are well made. Functional. Easy to clean. And most importantly the BIRDS LOVE THEM. Unique feeder! Bird's really like it and stop by often! I added this to a hummingbird feeder and no more ants! Worked perfectly. We offer 100% satisfaction guarantee on all our products. If you are unhappy in any way with your purchase please contact us within 30 days of receiving your item for a full refund. We guarantee to ship our products in 1 to 2 business days after purchase unless specified on the listing. In most instances we are able to ship the same day as purchase. For products shipping within the U.S. we use USPS Priority Mail. For products shipping to Canada we use USPS First-Class Package International Service. If you need an item shipped by express mail or internationally please let us know and we can create a listing to accommodate you. Thank you for purchasing a Peter's Feeder! Four Feeder Package: A complete set designed to attract the widest variety of seed eating and nectar drinking birds to your yard!